Global entrance security leader Boon Edam is introducing an elegant new multifunctional pedestal mount to further enhance the versatility, application and access protection technologies of its leading range of security speedgates. The new Lifeline Boost is a well-designed, innovative and unobtrusive pedestal mount that can accommodate an extensive range of authorisation technologies, to complement the Speedlane Lifeline range of speed gates, which has been proven across the globe, including with household names and Fortune 500 companies. “Lifeline’s new Boost feature extends the number of authorisation technologies that can be integrated with the speed gate, making it more versatile and readily applicable to corporate HQs, government offices, education facilities, banks, healthcare and private facilities,” says Boon Edam Australia Managing Director, Mr Michael Fisher. In addition to accommodating a wide variety of authorisation technologies, the Boost pedestal is easy and fast to install due to its unobtrusive, enclosed raceway that can house an electrical and ACS conduit along the surface of any finished floor. 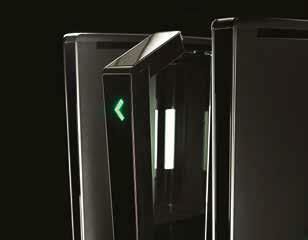 Its small footprint and sleek design complement the clean lines of the speed gate with minimal visual impact. “Lifeline Boost will give companies the freedom to use their access control partner of choice and integrate almost any system into a pedestal mount that blends in perfectly with the rest of the speed gates. It doesn’t look like an afterthought,” says Mr Fisher. “A key consideration for the new Lifeline Boost pedestal mount was blending an elegant design with sophisticated security features, in a product that’s simple and easy to use,” said Mr Fisher. The Lifeline Boost’s slim design and easy installation make it a well-integrated speed gate feature. Measuring just 106mm where it touches the floor, the Lifeline Boost also removes complications regarding under-floor wiring through the ability to install the mount directly into the Speedlane. The Boost’s uncomplicated and intuitive operation guides users as they provide their credentials and then pass through the speed gate. Intuitive LED lights detect the visitor approaching and guide them through clearly and easily – without any compromise to the journey flow. “Boon Edam already has the most speedstiles installed in the world, and now this new technology allows them to accommodate almost any authorisation technology available, giving ultimate flexibility and accessibility to companies that require an elegant and secure entrance solution,” says Mr Fisher. In keeping with the Lifeline series, the Lifeline Boost has been engineered with the comfort of the end-user in mind. It is ergonomic, set at a comfortable height and features the classic tapered V-shape, to effortlessly blend in with the rest of the speedstile. The outstanding energy-efficiency of the Lifeline range will be extended to the Lifeline Boost. LED lights guide users from their initial approach, through the authorisation steps and their exit into the secured side. When the speed gate isn’t in use, these lights enter ‘sleep mode’ to save power, and energy costs.